To make aioli: In a small bowl stir together mayonnaise, sour cream, lemon juice, parsley, and garlic until combined well and season with salt and pepper. Aioli may be made 2 days ahead and chilled, covered. In a food processor pulse crackers with flour, salt, and sugar until finely ground and transfer to a bowl. Cut flaps from squid sacs if attached. Cut sacs into 1/4-inch-thick rings. Pat squid dry with paper towels and season with salt and pepper. In a 3-quart heavy kettle heat 2-inches oil over moderate heat until a deep-fat thermometer registers 375 degrees. While oil is heating, toss squid in flour mixture to coat, shaking off excess. Fry squid in small batches, turning, until golden and crisp, about 1 minute, transferring with a slotted spoon to paper towels to drain. Make sure oil returns to 375 degrees between batches. 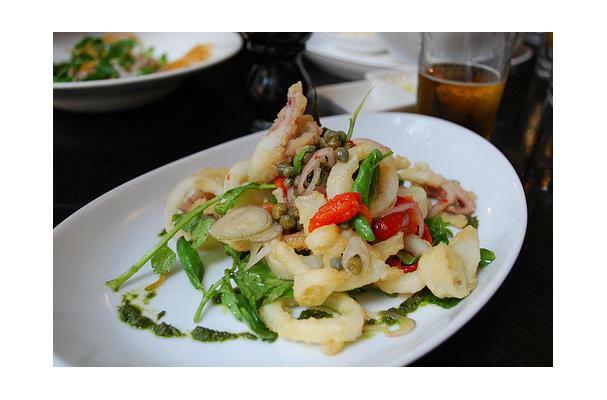 Serve squid with aioli and lemon wedges. This recipe yields 4 appetizer servings.